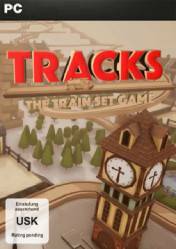 Tracks The Toy Train Set Game is only available in digital version and can be purchased directly from the Steam shop, or through digital keys in other online shops. It can be available in cd key format or in "Steam Gift" format, so pay attention to the format you are going to buy in each one of the stores. Don't forget that from Gocdkeys we compare the best prices, updated every day, so you can find the best deals for Tracks The Toy Train Set Game. Remember that you have a "price alarm" with which we will let you know when the game falls below a specific price. What about Tracks The Toy Train Set Game? Are you a fan of toy train models? Then this game is made for you. Tracks is a beautiful toy train game builder that offers the ability to create everything you've ever imagined. Through a system of building modules and parts, we can build bridges and cities, as well as all the accesses and rails of trains, locomotives, train stations, ... Everything we can imagine. Once we have everything built, we can get on the driver's seat and from a first-person view, we can control speed and direction, while we assemble the rails. We can create not only all the mechanical aspects of the game, we can also create everything around us, from trees and bushes, to all kinds of world biomes, buildings, stations, animals, vehicles, decoration and much more. There are no comments yet about Tracks The Toy Train Set Game. You can be the first one!